Yesterday I showed how Degas had "implanted" his head into the backside of a horse. That was not an unusual event, as I will try to show, but a standard element in his craft. Never seen before, these buried and unseen "self-portraits" are clearly key to his meaning. In this instance, a woman who resembles a figure from one of his bordello scenes reclines in an armchair, her elbows resting on its arms. She is dressed rather strangely in a transparent peignoir, a visual pun, possibly, on the French word to paint, peindre. Manet made the same pun earlier in his Young Lady of 1866. 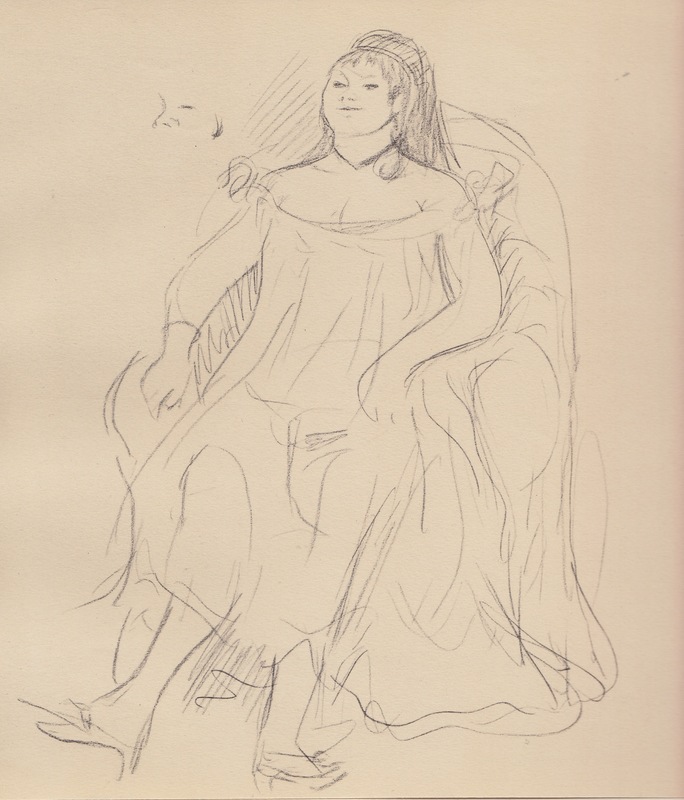 Degas, Seated Woman (1877) Crayon on paper in notebook. 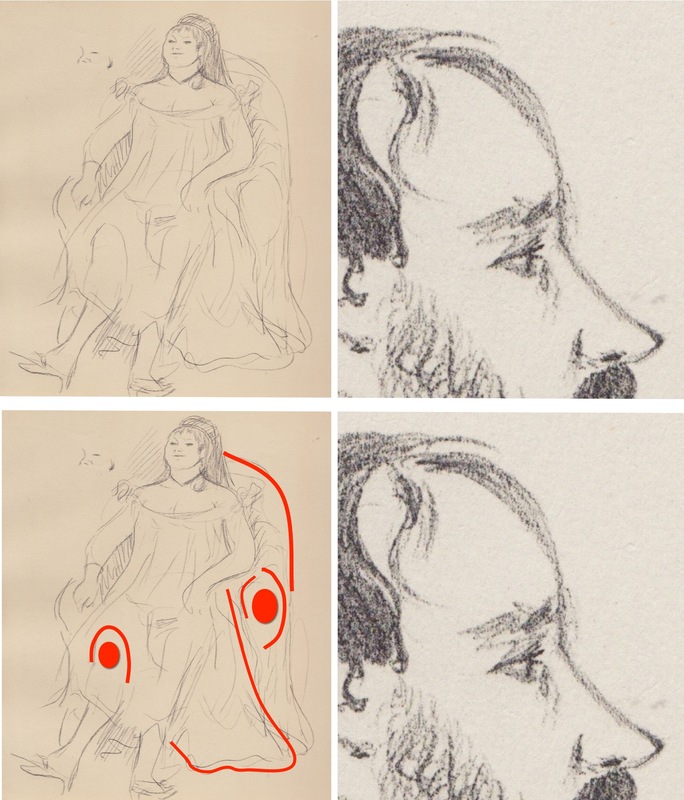 If we compare the drawing to a self-portrait from the same notebook, 2 pages before, you can see how the back of the chair echoes the sweeping contour of his forehead (see diagram). His eyes are in the oval of the chair-arm on the right and the curve of clothing over her right knee. That, too, could be a pun since the Italian for knee - and Degas spoke Italian1 - is ginocchio and occhio means eye. The ski-slope nose, his most identifiable feature, can be seen in the superfluous fabric of the chair cover. 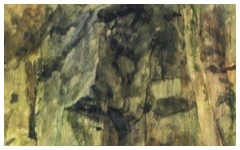 R, top and bottom: Detail of Degas' Self-portrait (1877) from the same notebook, 2 pages before. His head is looking to the right at the mirror-angle of the woman facing the left. She is literally and metaphorically a reflection in his mind. She also faces the same direction as Leonardo's enthroned Mona Lisa and the dozens of subsequent figures based on hers, all imitating an artist facing an easel off to one side as the figure "draws" or "paints" a self-portrait. The artwork is theoretically located where their mirror would be. In this instance, the presumed prostitute, representative of Degas' androgynous and fertile mind, seems to be admiring her handiwork. In a transparent peignoir - perhaps referencing Degas' veiled meaning - she is conceived where she was conceived - in his head. 1. Degas himself was partly Italian and, when young, stayed with his Neapolitan relatives for an extended period. Original Publication Date on EPPH: 15 Jul 2014. © Simon Abrahams. Articles on this site are the copyright of Simon Abrahams. To use copyrighted material in print or other media for purposes beyond 'fair use', you must obtain permission from the copyright owner. Websites may link to this page without permission (please do) but may not reproduce the material on their own site without crediting Simon Abrahams and EPPH.